Has 102 recipes, 13 public recipes. Has 233 flavors in inventory. Mrcoldone supports All The Flavors. Upgrade yourself. Every time remix month comes about, I like to go after that elusive eliquid that had previously escaped me. After numerous attempts from the community to get a Duchess remix, I finally feel like this is worth releasing to the public. This is a few years in the making and I like to give credit to Method aka Mr. Hardwick for laying the foundation and getting us to this point. In Duchess Reserve the thing that always had me baffled was the cookie aspect, I lowered the butter pecan to .25%, and it’s critical to not overpour because it can take over fast! And added in some graham cracker to round out the cookie notes. Also the cakey aspect, I feel like the cake batter dip combined with tres leches covers that pretty well, and adds some sweetness, cake batter dip may have just been the missing link. I went back and forth with TFA vanilla custard, FW, and Cap VC, to me the Cap version was closer to the original in every aspect. 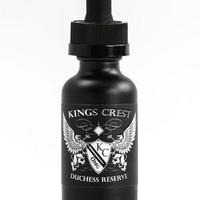 Looking back to the time this eliquid came out, I could easily see them exclusively using FW and just getting the Cap Vanilla Custard from a vendor and buying that one concentrate in bulk. At that time, Cap VC was king and still is to this day. Especially after a good steep. With that being said I do need to move on from this chase, and I’m happy to do so now since I really do think we’re damn close. Here I present my final version of the Duchess Reserve for #remixmonth. Here's my attempt at a Boosted remix. This is a recipe I've been chasing for atleast 3 years now and while it's still not exact, I do feel this is the closest recipe out to the original. After going out and getting a few bottles I actually feel they may have changed the formula, I remember the original being really buttery and creamy. But non the less it's still a great recipe. Another simple 3 ingredient recipe, (all TFA) here is my simple Peanut Butter Cheesecake recipe. I like to make this with 1% FLV PB and 1% LA Cream Cheese Icing added but it's still a great recipe as is, and a great recipe for those who don't like to add in a bunch of flavors. Feel free to add sweetener to taste. Just to be clear this is a shake and vape recipe. In my opinion, peanut butter dies and kind of taste bland after a steep. So again this is formulated as a shake and vape only, and is best right away. Every mixer has their classic Strawberry Milk recipe. This is the version I like to mix. It's sweet, creamy, milky, strawberry goodness. Pretty self explanatory, but this was a long process to get it to where I was actually happy releasing it. I've been playing around with FLV cookie dough for a little bit, and after Wayne released Obsidian it definitely inspired me. FLV cookie dough is a little weird to work with, at first I really didn't like it. It almost has an RY4 taste to it right away as weird as that sounds, to me atleast. But I can see why Wayne went that route. With some supporting flavors and of course a little time it does come out pretty tasty! I don't add any sweetener here, and it probably would benefit from some, so add .5% super sweet if you want. FLV Cookie Dough, and FLV Frosting are a little harsh right away, so I do like to add a little more VG. This is my spin off from Obsidian, here I present MrColdOnes Creamy Cookie Dough! This is one recipe that I always keep a 120 in stock. A creamy, thick raspberry cheesecake! My favorite cheesecake recipe to date! I love the way LA cream cheese icing blends into the Cap NY cheesecake and it's something I've been adding to a lot of my cheesecake recipes. It really makes the ny cheesecake stand out against the raspberry combo. I use INW Raspberry and TFA Raspberry sweet together in a lot of my raspberry recipes, and the apple pie to make the raspberrys pop and add some depth to the overall cheesecake crust. FLV cream is now my favorite cream to use, so I went with this instead of Cap VC. You can add the sweetener of your choice, but I think it's sweet enough as it is. This is one of my favorite custard recipes I've been making for a while now. I've made a few changes and figured I'd put it out there. The FW Blueberry, FLV Blueberry Muffin, FA Blilberry, and INW raspberry combo make a very sweet, and almost realistic blueberry. I sometimes use FA Fuji in place of the INW Raspberry, but I like my blueberrys a little darker with a custard. Speaking of custard I use the good ol Cap V1 VC as my go to custard, along with TFA cheesecake graham crust to provide that depth. And of couse I had to add in the combo of FLV Cream and INW Shisha Vanilla, made famous from the recipe "Longing" to finish of the cream base. Being the custard fan I am, I could vape this and Coop34's Raspberry Custard forever and probably not get sick of it. Let sit for a good 7 days, as with any custard it gets better with time. Hope you all enjoy! This recipe originally came about during my quest to create the Mexican candy Pelon Pelo Rico into a vape. Living in the Southwest Pelon is a staple at every convenient store and it only made sense to recreate it. While this recipe is not exactly Pelon, it is something similar, almost like taking all of the Mexican candies on the shelf and mixing them into a bowl. (Make sure not to over pour the FLV heat, too much and it can really take over and be un vapeable, for me at least, I do like 1 or 2 drops in a 30 ml.) Here I bring you the candy of Mexico! An easy three ingredient spot on vanilla powdered donut recipe. I used to mix this up with Cap Glazed Donut, but since FA Zeppola came out it has definitely been my go to for a donut base. This recipe could be tinkered and made more complex, but it's delicious as is and showcases just how good of a flavor Zeppola is. I gotta say your a genius for coming up with this madness. I like it best without the koolada because I just hate anything menthol basically. And at first I hated this juice, because I got a weird alcohol note. But like others have said, I just keep coming back to this. I kept just making 30's because I didn't think I would like this. Then I made 60's. Now I'm making 120's lol. Great job man! Closest recipe to the duchess I've ever had!! Awesome job by Mr. Hardwick! Very nice ice cream flavor! I was hesitant to buy FLV cream just because I think FLV is way overpriced, but I'm glad I did. This is probably the most authentic, real tasting ice cream vape I've ever had! And the honeysuckle is so perfectly balanced into it. I can definitely see why this won the diyordie contest! This is a really hard juice to find a right balance to even everything out. Anyone that's tried their hands at something like this knows what I'm talking about. But ID10-T absolutely nailed this profile. After the gem Longing, I've been mixing a lot of his recipes and this man is a true genius. He's opened up my eyes to so many flavors that have been gathering dust in my cabinet. I really really like this strawberry cream! Theres something about the mix of FLV Cream and Shisha Vanilla that really nail the cream base. And this combo of strawberrys are layered perfectly in this recipe. This recipe will be a staple in my rotation for sure! Awesome job!! Very nice custard!! This and your Raspberry Custard are my two favorite custard vapes and that's saying a lot! Great job Coop can't wait to see what other gems you put out in the future! I love sugar cookie! And like a more pronounced cookie so 1% FA Cookie with the 6% sugar cookie worked really well here! I really liked this as a shake and vape! Great job. Can't wait to see what you put out in the future. I'm entering a score of 5 without the FA joy. With it it's a 1 star just because I'm so sensitive to that flavor and even .5% all I get is beer. But without it and I upped the butter cream to 1.5% I definitely get a circus cookie! So great job achieving that! I tried to tackle this profile a few years ago and it's not easy to get that circus cookie flavor to shine. Again anyone that is sensitive to FA Joy I suggest to just leave it out and you'll still get the profile!! The hype is real!! This stuff is spot on Cinnamon Toast Crunch! Great job!!! I'll be making a 120 of this today!! I made this about a month or so ago and have been vaping this nonstop for a few days! I really like the mix of tfa gelato and cap vbic!! Actually feels like I'm eating a real butter pecan gelato!! Great job Krucial! I'm crowning you man!!! This is a sad/happy day! A sad day because many people, myself included have chased this recipe for so many years! And I'm almost sad to see it come to an end. But such a happy day because I can now make as much mother's milk in my own home. After looking at this recipe it all makes sense too. I went up and got a bottle of mother's milk and after a two day steep this recipe is so damn close I'll even say pretty much exact. Awesome freakin job man!!! I love this recipe! How simple, yet complex it is. Coop34 was always one of my favorite mixers. Still to this day his Raspberry Custard is in my top 3 favorite juices. Thanks for sharing Dave! Damn Wayne, I can't tell you how happy I am that I found this flavor! I know I would've never ordered rice before, that's for damn sure! I've made so many banging recipes using this base and the sky is the limit, when it comes to bending the FE rice in other recipes! Thanks for showing us DIYers how good this under the radar flavor is! This is a damn good version of Duchess!!! When i seen the Gelato at 4.5% i was a little skeptical, but dang it hits the mark and gives it that Duchess creaminess. It’s only sat for a day so i know it’s gonna get better, but as of now I’m impressed!